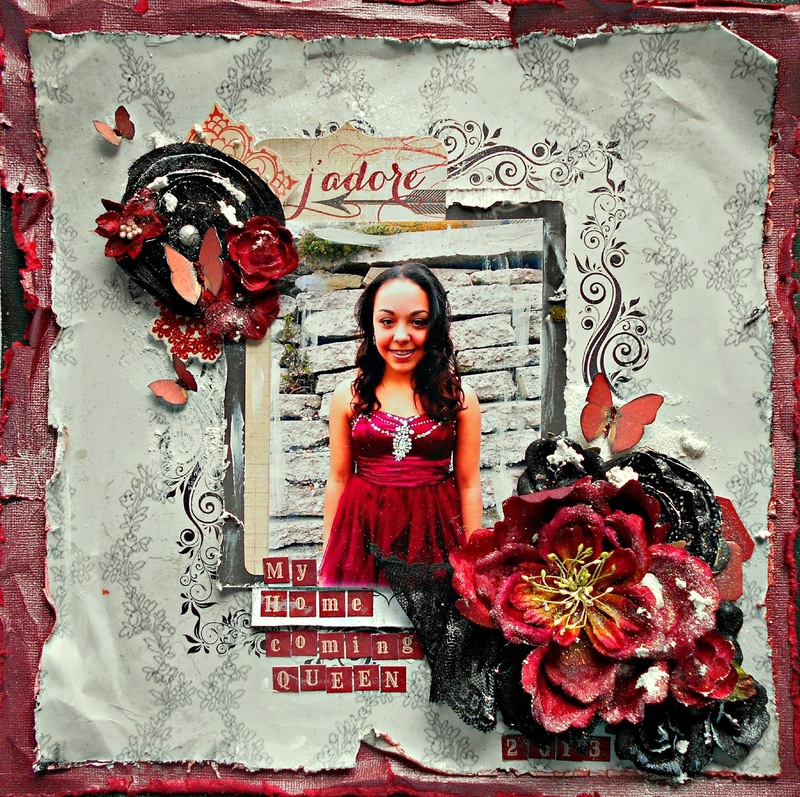 lifetime of pages: February Kit Pages with C'est Magnifique..
February Kit Pages with C'est Magnifique.. 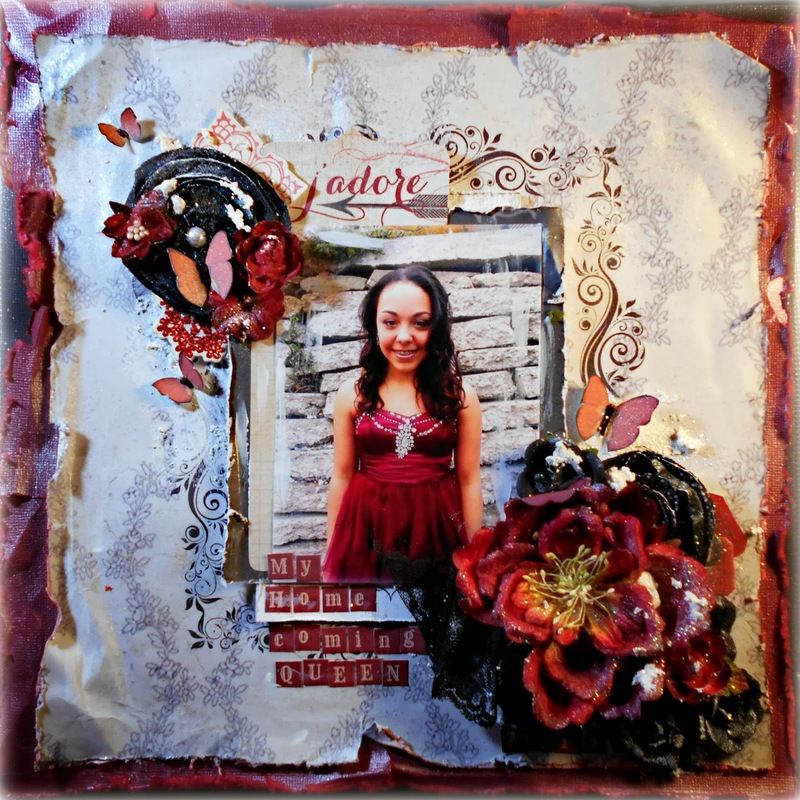 I am excited to show you my pages from the romantic February kit featuring the new paper line from Manor House! With my first page,I kept the monochromatic scheme and wanted to show the classic side of the kit. Naomi has a Black and Tiffany Blue bedroom and stole this away from my scrapdesk as soon as it dried.. 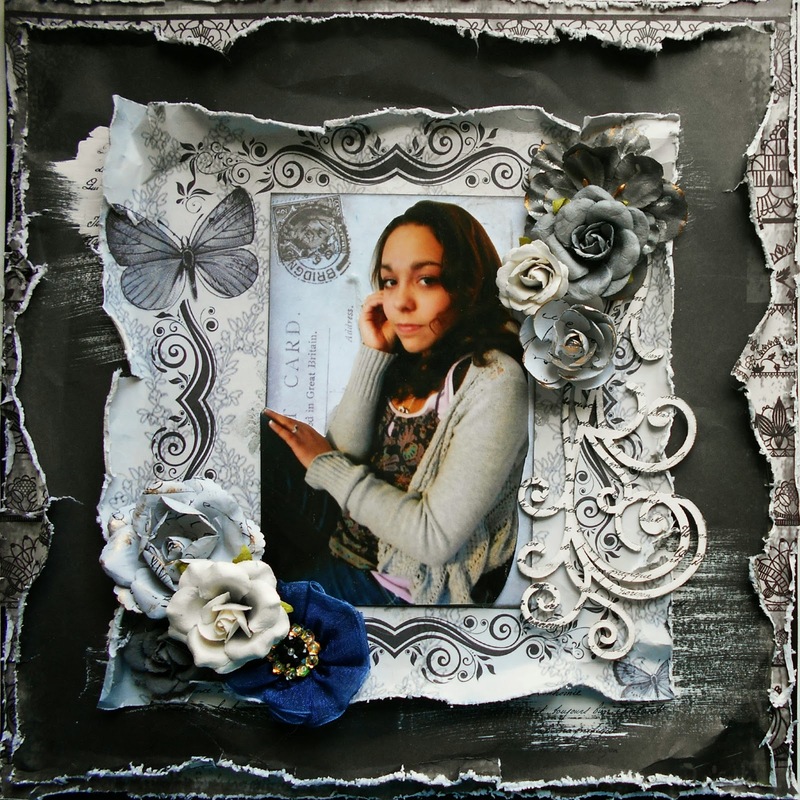 I used gesso on the black paper and the Blue Fern chippie,stamped using the French Script stamp from Something Tattered..I love how the cool greys and blues create a sense of sophistication to the page. 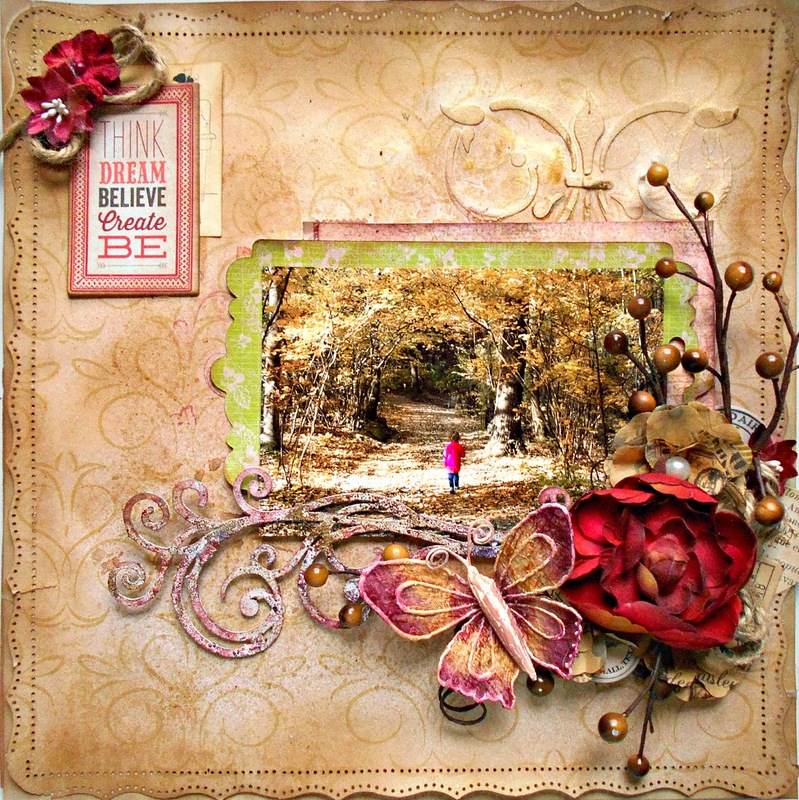 Using Distress inks and Lindy's Starburst ink in Steampunk Sepia,I warmed up the background. 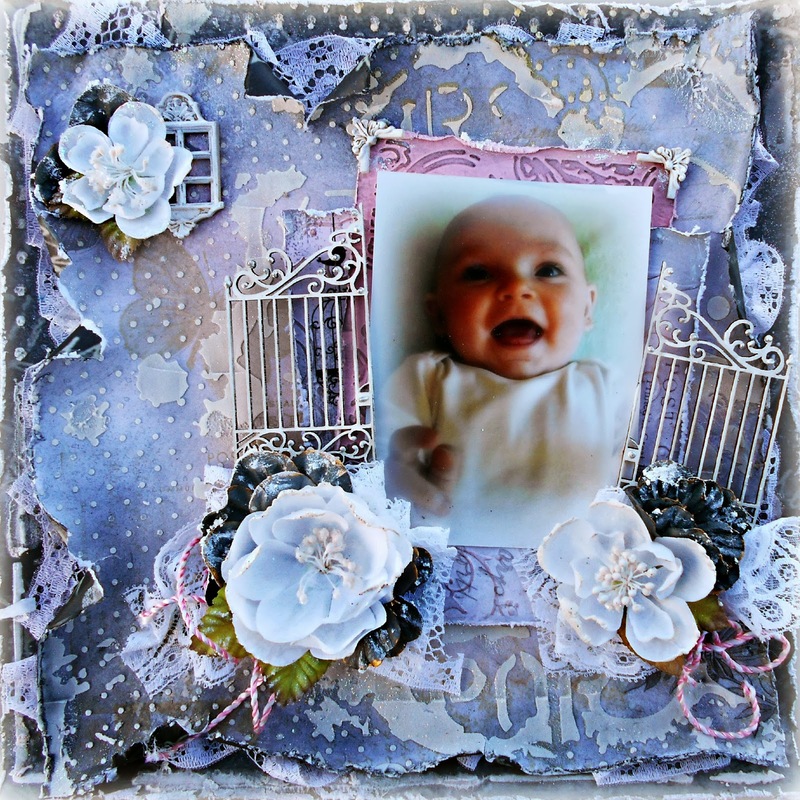 I added some texture paste and stencils that mimicked the paper pattern and misted some more. I gessoed and embossed the Blue Fern Flourish using this technique from my friend,Rae. The pic is my little niece,Vivien as she makes her own little way in the woods..
For layout #3,I broke out all my mixed media toys..
First,I shaded the paper using Distress inks and more Lindy's Stamp gang mists. I used texture paste and a large Prima stencil. I distressed my edges and tucked in some lace and twine from my stash. The gates were also gessoed and highlighted with a Viva pearl pen. I love the pretty resin pieces in the kit and all the lovely white Prima blooms that make this layout feel light and airy. Yes,that's Vivi again..
For page #4, I went with traditional Valentine's colors,even though I struggle with reds for some reason.. The kit comes with Sno-Tex,which was perfect for my daughter's November Homecoming Dance. I sprinkled Diamond Dust while it was still wet and it has a magical sparkly look in real life. The butterflies are courtesy of Lisa Gregory and were hit with Burgundy Stickles. There are lots of cute ephemera and little envelopes that are perfect for mats and tucking in clusters. 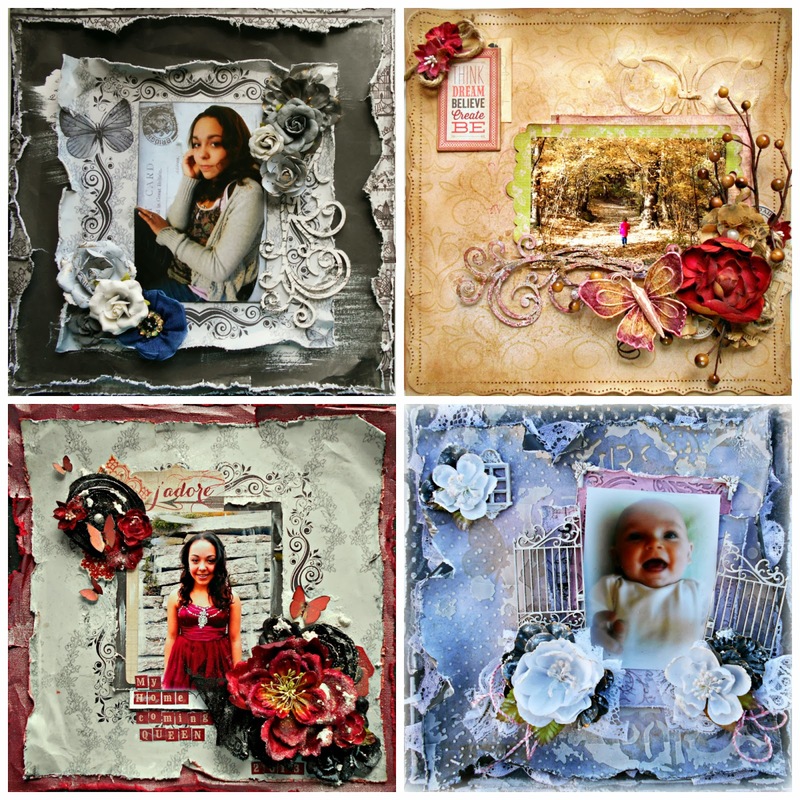 So there you have it..4 completely different looks from this fabulous February kit! I still have one more page to reveal on sketch day and stay tuned for our full reveal on January 30! These are all SO amazing that I can't even pick a fave! Love how you've presented the different looks of the kit! Great idea! Saw these fabulous pages over at CM - amazing variety. I think the walk through the woods is my favourite... glorious colours and berries, and the treatment on that flourish is stunning! Oh my gosh, these layouts are all so different yet so stunning. All four are fabulous!! Wow these are stunning, cannot pick a fav, each one shines.. love the flourishes you have used, and stunning flowers too.. These are all so beautiful, but that first one~so gorgeous! I love the greys and blacks with the distressed edges and touches of grunge, and that you did the hints of navy~so yum! !